Can you imagine wanting something for dinner and no one understanding what it is you are asking for? Can you imagine trying to communicate with gestures only to appear as if you were playing charades? That is how many of the deaf elderly in Acadiana lived until Amelia Manor Nursing Home opened its doors to the deaf/blind community. Through the persistence of two ladies, Ms. Paulette Guthrie and Glynis Kibodeaux, the lives of the senior deaf/blind community have been forever affected in a very positive way. After visiting with many of the deaf/blind population around Acadiana, Ms. Paulette saw the need for a safe haven for this community, and Amelia Manor delivered. Owners Willie Belle Sarver, Alberta Lyons, as well as nursing home Administrator Greg Sarver, embraced this challenge and opened their doors and their hearts to the deaf/blind community six years ago. Ms. Kibodeaux is the deaf/blind coordinator and has created classes for Certified Nursing Assistants to give them the capabilities to communicate with deaf/blind patients. There is staff with sign language abilities around the clock at Amelia. The Therapy Center has also played a part in accepting these residents with open arms. “At times, we as therapists put our patients in challenging positions/situations necessary to challenge their central nervous system to improve their balance, coordination, motor planning and safety. Being able to communicate via ASL (American Sign Language) has assisted us in establishing a rapport and trust which has led to increased participation and decreased resistance necessary to increase their independence with self-care tasks. In general, they are just like you and I. They have a lot to say and want to be heard, not ignored due to communication barriers,” says Victoria, MOT, OTR/L, C/NDT. 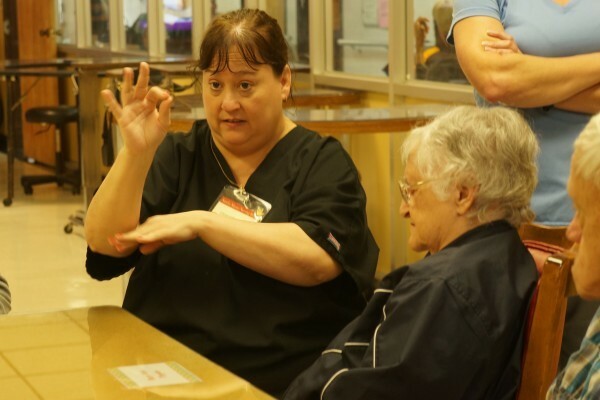 “It has been rewarding to be able to learn sign language and use it effectively in order to assist our residents in improving their quality of life while residing in our nursing home,” says Ashley, DPT. “I feel like the deaf and blind population benefits from therapists on our team being educated in sign language as it makes them more comfortable and helps them get the maximum benefit out of their treatment session,” says Sara, PTA. For more information on the deaf/blind program at Amelia Manor, please contact Glynis at Amelia Manor Nursing Home (337) 234-7331.